It is a structured, measured set of activities designed to produce a specified output for a particular customer or market. It implies a strong emphasis on how work is done within an organization" (Davenport 1993). Operational (e.g. fill a customer order). 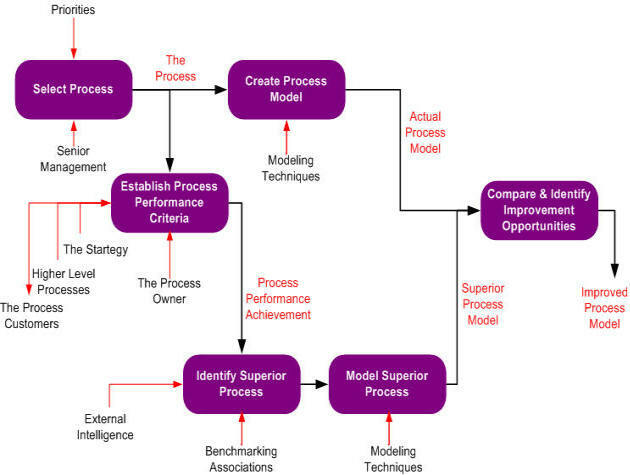 It is the analysis and design of workflows and processes within and between organizations" (Davenport & Short 1990). Processes controlling and coordinating the organization's activities to ensure that business objectives are delivered. 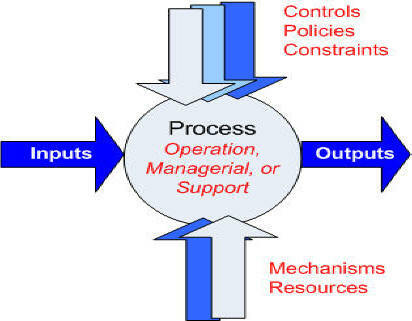 Processes provide infrastructural and other assistance to business processes. One of the main goals of introducing BPR is to get a Competitive Edge and that can only be gained by providing the customers more than what the others in the market are asking for. How effective is the product or service that the business or manufacturing company providing the customer? How efficient is the company that is manufacturing the product before introducing it to the market to maximize costs? This is one of the key categories that is believed to be more important than any others. 7. The Principles of Business Reengineering (Coulson-Thomas, 1994). Externally, focus on end customers and the generation of greater value for customers. Give customers and users a single and accessible point of contact through which they can use whatever resources and people are relevant to their needs and interests. Internally, focus on activities which deliver value to customers. Encourage learning and development by building creative working environments. Concentrate on flows and processes (including communication) through the organization. Give priority to the delivery of value rather than the maintenance of management control. Keep the number of core processes to a minimum (approx. 12). They all should be directed to external customers. Ensure that continuous improvement is built into implemented solutions. Network related people and activities. Virtual corporations are becoming commonplace in some business sectors. Implement work teams and case managers extensively throughout the organization. Re-allocate responsibilities between the organization, its suppliers and customers. Encourage involvement and participation. This requires error-tolerant leadership. Ensure people are equipped, motivated and empowered to do what is expected of them. Where ever possible, people should assume full responsibility for managing and controlling themselves. This requires planning skills. Work should be broadened without sacrificing depth of expertise in strategic areas. Avoid over-sophistication. Don't replace creative thinking with software tools. Build learning, renewal, and short feedback loops into business processes. What are the objectives of the process ? Are these objectives in line with the corporate objectives ? Do you need the process ? What value does it add to the corporate mission, vision or strategy ? Who are the customers of the process ? What are the customers requirements ? Does the process meet the customers requirements ? What problems does the process have in meeting its customers needs? Who are the suppliers of the process ? Have told them the requirements of the process ? Are these correct ? Is there any waste in the process ? - How can we eliminate it ? Who is responsible for the process ? Who else could do it ? Is the responsibility located correctly ? Projects are aimed at single and isolated tasks, activities or single function. Eliminate costly paper work by introducing an e-mail system to internal communication. Reengineer the sourcing process to ensure that the lowest cost suppliers are being selected. Projects target cross functional business processes, but are contained within a business unit. A bank has created a simplified, one page form for loan applications for those customers, seeking up to US$ 60k. Introduce self-directed work teams to the order management process in a manufacturing company. A bank dissolves all existing 120 branches, and introduces an extremely user-friendly direct banking system on the Internet. Projects bridge between two or more business units, such as the company and its customers and suppliers. Link up with one particular vendor for cost saving purposes in product design and parts delivery (single source concept). Example 3.2.: Reengineering the delivery process between a german machine manufacturer and all its European automotive parts suppliers (just-in-time processes). An automotive company externalizes all employees, except a staff of thirty people. Former employees turn into entrepreneurs and form a network of suppliers together with other vendors. Both TQM and BPR share a cross-functional orientation. TQM focuses on incremental change and gradual improvement of work processes and outputs over an open-ended period of time. BPR seeks radical redesign and drastic improvement of processes a bounded time frame. Six Sigma is a new and improved BPR which has been reworked, reanalyzed and renamed for the employees’ sake. The BPR Online Learning Center is a comprehensive directory and resource guide for business process reengineering teams. The learning center offers an index of articles from around the world, an online tutorial series, benchmarking studies, yellow pages for BPR resources and information on reengineering toolkits and templates for project teams. Process Management for Continuous Improvement, Quality Solutions Inc.
Their stated focus is to assist those who are in the process of reengineering their organizations. Links to world best quality resources & top best practice management web sites. Caron, M., Jarvenpaa, S.L. & Stoddard, D.B. (1994, September). "Business Reengineering at CIGNA Corporation: Experiences and Lessons Learned From the First Five Years," MIS Quarterly, pp. 233-250. This community is focused on redesigning and improving existing processes and in creating new business processes. Individuals interested in this community focus on methodologies like Rummler-Brache, IDEF, SCOR, Six Sigma, and LOVEM, and on tools to assist in modeling As-Is and To-Be processes.